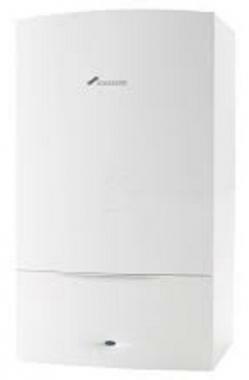 The Greenstar 18i is a highly efficient wall mounted boiler by Worcester Bosch. It is a system boiler that is perfect for medium or small sized homes. It is a highly efficient model coming with an output of 18kW and an efficiency rating of 94% (making it A rated). The Greenstar 18i is compatible with a wide range of accessories such as the Greenskies solar panels helping to cut your energy down as well as reducing your bills. It can also be used in conjunction with the high efficiency Greenstore cylinders. With the Greenstar being designed with you in mind it comes with a simple clear information display making it easy to use. As well as the wide range of controls, it is built with the best technology to help make it a more reliable boiler. It boasts a low energy pump that helps to reduce the electrical usage, and a large condensesure style siphon that is built into the boiler to help reduce the risk of frost on the unit. This boiler is able to fit in a standard sized cupboard to make it easy to hide away. It comes with five years warranty, giving you the added security that you are buying a reliable boiler.